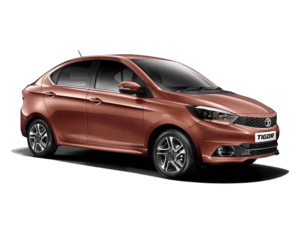 The front profile of the Tata Tigor looks very similar to the Tiago apart from the new smoked out headlights with projector units and slightly revised grille up front. From the side you would notice new chrome highlights on the window line and shiny new 15-inch alloy wheels that look very appealing. Sadly the 15-inch alloys will be only offered with the petrol version while the diesel version will get 14-inch alloys with different pattern. The silhouette of the Tigor when viewed from the side is very coupe-esque that looks very well done. Tata has mastered the integration and the styling of the boot for a sub-4 metre sedan. The steeply raked rear windscreen merges seamlessly with the boot and doesn’t look abrupt from any angle. There is a high mounted LED stop lamp with roof integrated spoiler. The LED tail light units look very cool in the dark while the chrome strip on the boot and sporty rear bumper adds to the visual appeal. The styling of the Tigor attracts quite a lot of eye balls out on the road. A 1.2-litre petrol does duty on the Tigor. This engine is fantastic. It is smooth and very easy to drive. There is no oomph factor about it. It has been tuned for better mileage than performance. There is sufficient power to overtake but then it doesn’t have the refinement. There is an evident petrol engine noise and some amount of vibration at low speeds. But then this engine is smooth and is easy to drive in the city or even on the highway. Job done! 5-speed manual box is sleek and short. The diesel engine on the other hand has very linear power. There is good enough power at low engine speed, but it is comfortable to cruise in. Even for the highway, it is a good vehicle to cruise in. At the same time, one needs to downshift to make those quick overtaking moves. Tata Tigor has a smaller size engine, and the power doesn’t match up to the competition in the diesel engines. The engine is fairly refined and has very low engine noise. The diesel engine clatter is audible only after 4000rpm. There is high levels of refinement in this engine. In performance, petrol should be your pick, while diesel is more of a mile muncher option. There are some additional features on offer too. For instance, there is a touchscreen system. This gets reverse parking camera and even navigation.The Tata Tigor comes with an integrated music system on the top-of-the-line variant. This has an Harman music system with bluetooth connectivity, USB and even aux. It plays music through eight speakers. The five-inch screen has reverse parking display, SMS display and readout, step-by-step navigation for Android phones and Juke-car app. This app allows to connect multiple smartphones to the music system at the same time. There will even be climate control, which isn’t offered on the Tiago.The rear seat on the Tata Tigor has centre armrest too. There is even JukeCar app that has been built only for Tata vehicles. The touchscreen system will be there and this will even get reverse parking camera.The air-vent colours may come colour coded. The panel surrounding the AC vents and the centre console has an option to be changed to any colour that is available. In terms of driving, the Tata Tigor ride has a very supple ride. It irons out most of the road bumps and it does a fairly good job. The handling too, is one of the best in its segment. Push it around a bend and the hatchback does a good job. The steering wheel is light and still has good enough feedback. This is what makes it stand out. The fuel tank capacity of the Tata Tigor is 35 litres, which will be sufficient for long road trips as well. The ride quality of this vehicle is good and what stands is its handling. It is a good mix of ride quality and handling characteristics. The ABS on offer comes with EBD (electronic brake force distribution), corner stability control (CSC) for enhanced braking efficiency.